Egyptians are set to vote in the second round of their first free presidential election in a two-day run-off. Mohammed Mursi, head of the Muslim Brotherhood’s Freedom and Justice Party, is up against Ahmed Shafiq, Hosni Mubarak’s last prime minister. The ruling Supreme Council of the Armed Forces has promised to hand over power to the winner by 1 July at the latest. But the build-up to the election has been marred by a Supreme Constitutional Court decision to dissolve parliament. On Thursday, a panel of judges – appointed by Hosni Mubarak – ruled that the law governing Egypt’s first democratic elections in more than six decades was unconstitutional because party members were allowed to contest seats reserved for independents. The Freedom and Justice Party won about 100 of its 235 seats in the People’s Assembly by running candidates for individual seats. If parliament is dissolved swiftly by the ruling Supreme Council of the Armed Forces (SCAF), whoever wins this weekend’s presidential run-off could take office without the oversight of a sitting parliament, and without a permanent constitution to define his powers or duties. A 100-member assembly appointed by parliament earlier this week to draft the new constitution may also be dissolved. Islamist, liberals and scholars denounced the ruling as a “coup”, saying they feared the ruling generals would take back legislative power. 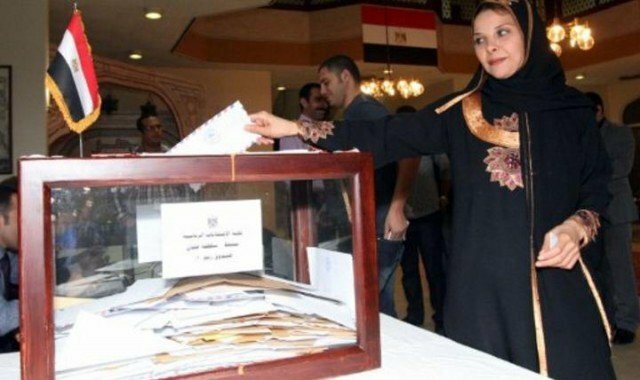 “This series of measures shows that the Supreme Council of the Armed Forces, the head of the counter-revolution, is adamant to bring back the old regime and the presidential elections are merely a show,” six parties and movements said in a joint statement that also urged Mohammed Mursi to boycott the run-off. The Supreme Constitutional Court also found a law blocking senior Mubarak-era officials from the presidency – which would have ruled out Ahmed Shafiq’s candidacy – was unconstitutional. The law was passed by parliament before the presidential election’s first round. On Friday, the Muslim Brotherhood vowed to win the presidency despite the signs of opposition within the judiciary, which is overseeing the vote. “Isolate the representative of the former regime through the ballot box,” said a statement referring to Ahmed Shafiq, who also served as head of the air force and minister of aviation under Hosni Mubarak. The Brotherhood warned that the progress made since the president was forced to step down was being “wiped out and overturned”. Egypt was facing a situation that was “even more dangerous than that in the final days of Mubarak’s rule,” the group added. Mohammed Mursi meanwhile sought to reassure the military and its supporters within the electorate that he would work closely with the generals. “As president, they will be in my heart and will get my attention… they will never do anything to harm the nation,” he said. On Thursday, Mohammed Mursi warned there would be a “huge revolution against the criminals” if there was any evidence of electoral fraud. His opponent meanwhile told a rally that the court rulings were “historic” and that the “era of political score-settling” had ended. On Friday, Ahmed Shafiq promised to “address chaos and return stability”. He came second in last month’s first round, in which turnout among the 52 million eligible voters was only 46%. Official results gave Mohammed Mursi 24.8% and Ahmed Shafiq 23.7%. Polling stations are due to open on Saturday and Sunday at 08:00 and close at 19:00, but voting is likely to be extended on both days. Final results from the Higher Presidential Election Commission (HPEC) are due by 21 June, but are expected to arrive much earlier. Partial results from the first round were declared within 24 hours. US Secretary of State Hillary Clinton has called for the SCAF to transfer power fully to a democratically elected civilian administration as soon as possible following the announcement of the final result of the election. “There can be no going back on the democratic transition called for by the Egyptian people,” she told reporters in Washington. Diane is a perfectionist. She enjoys searching the internet for the hottest events from around the world and writing an article about it. The details matter to her, so she makes sure the information is easy to read and understand. She likes traveling and history, especially ancient history. Being a very sociable person she has a blast having barbeque with family and friends.